For audiences who enjoyed the first two episodes of Klapisch’s comic musings on the world as seen through the eyes of a group of European students (L’Auberge Espagnol and Poupées Russes), Casse Tête Chinois is a delightful opportunity to catch up with Xavier (Romain Duris) and his band of copains as they contemplate life as forty-somethings. This time Klapisch astutely moves the action away from Europe to New York, placing the characters out of their comfort zones both linguistically and culturally and injecting a new energy into the tired format of ageing friends periodically meeting up to share life’s joys and disappointments. The story picks up with Xavier and Wendy (Kelly Reilly) who, after ten years of domestic bliss, realise the spark has gone from their relationship. She has met someone else and wants to move to New York and take the kids. Xavier, distraught at the thought of losing his children, decides to follow her across the Atlantic and moves in with a lesbian friend from his Barcelona days, Isabelle (Cécile de France), who’s already living in New York with her girlfriend. 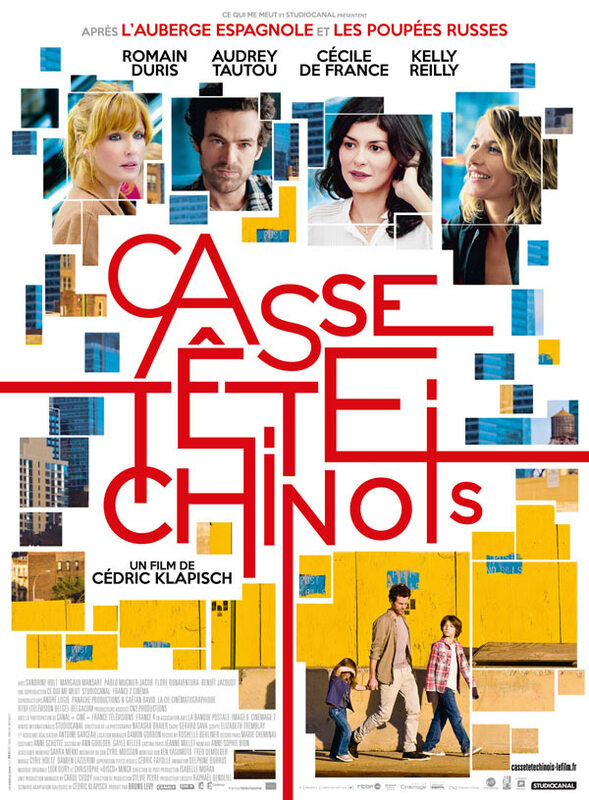 With no home, no job and no possibility of finding work, Xavier decides to up the ante by agreeing to father a child with Isabelle and inviting an ex-girlfriend Martine (Audrey Tautou) and her kids to New York for a vacation. Throw in an arranged marriage, a dodgy lawyer and Xavier’s involvement in Isabelle’s extra-marital activities and his description of life as “complicated” sets the comic tone for the whole film. Undoubtedly Klapisch’s skill in maintaining interest in this group of friends lies with the exceptionally talented bunch of actors he employs. Duris, de France and Tautou represent some of the best of a younger generation of actors in France. Duris, in particular, has shown great versatility moving from award winning films such as The Beat My Heart Skipped to the more frivolous, Heartbreaker, alongside actress/singer Vanessa Paradis. De France is known to foreign audiences after appearing in Clint Eastwood’s Hereafter, while outside France, Tautou will always be Amélie Poulain. The cast create an irresistible energy despite the thinness of the storyline which struggles to stretch to the running time of almost two hours. Who could resist Duris’ boyish charm, or de France’s raunchy zest for life? As for Tautou, here she has perfected the vulnerable, girl-next-door, image that serves her so well. And New York has never looked better. With its autumnal coloured buildings and graffiti covered walls, Klapisch depicts a city miles away from the glitz and money of uptown Manhatten. A dirty, crowded place with unfriendly subways, noisy streets and an ever-present threat of violence – but a city where anything can happen.